My Row by Row top is complete with extra blocks on the side (for added width), and borders all around. Did I take a picture of that before loading it on the frame? No! But at least I have an 'in progress' picture of the quilting to show. Can you see the blue 9-patch blocks at the top of the picture? Those are for the extra width. And the border is at the left, made from three fabrics, a dark blue, a green, and a multicolor print. 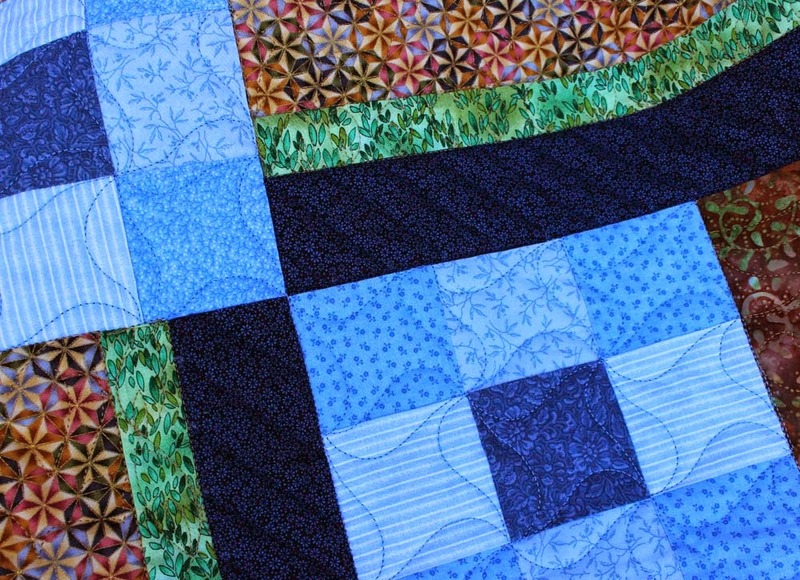 The outermost border has a random quilting design, the same that was used in Black and White with a bit of Red. For some reason, I like that random fill--it's fun to do. The green border has leaves in it, and the blue has diagonal lines that form a 'V' in the center. No picture of those either, as the thread blends in and it's hard to see. 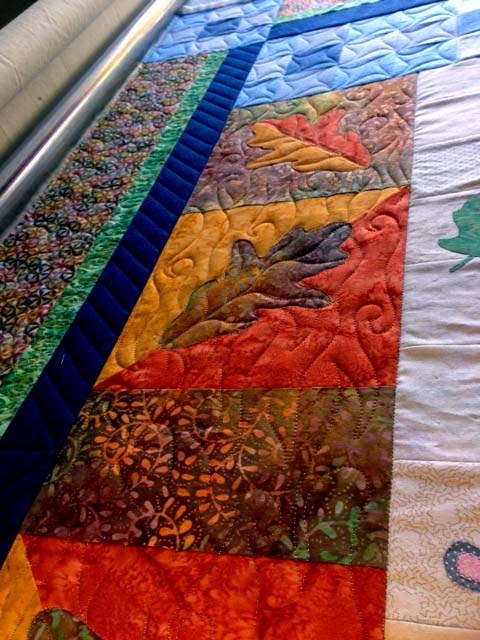 The leaf row has quilting to give the impression of blowing wind. And the leaves are outlined and veined, all in a burnished gold colored thread. 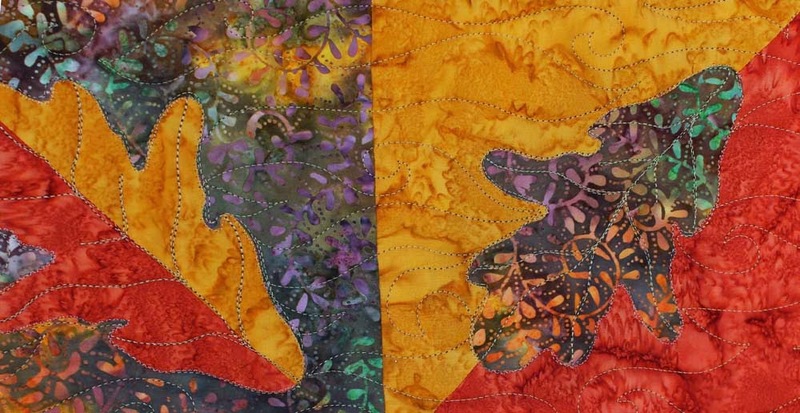 As for the edge 9-patches, each square is quilted with four 's' style curves. A pretty little star effect. If you want to see the rows as they are finished quilted, follow me on Instagram at 'quiltfabrication'. And of course, as seems to be the case with Instagram, you'll see sunsets and cats, but mostly quilts! Tomorrow, I'll reveal my Book of the Month project. I've decided to start in on the stack of nickels and strips from the shop hop, instead of pulling out fabric for yet another project. Might as well start something that's waiting to be started! I have a pattern in mind, I just need to find it on the bookshelf.